Fenerbahce Ulker Istanbul led from start to finish in downing PGE Turow Zgorzelec 89-74 for its third consecutive victory. 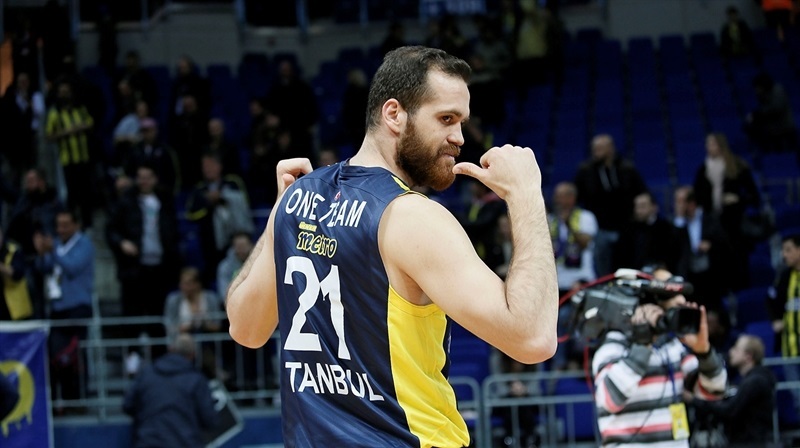 Fenerbahce improved to 5-2 in Group C. Turow dropped to 1-6. 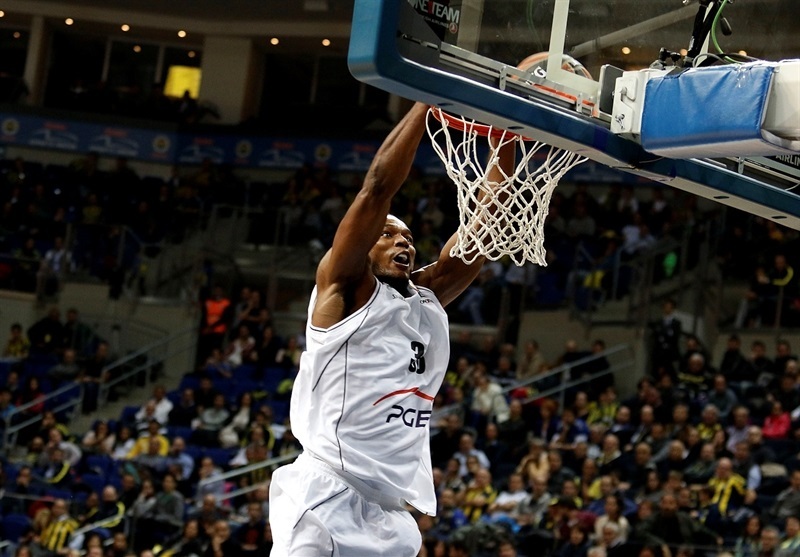 The hosts stormed out of the gate and behind Andrew Goudelock and Bogdan Bogdanovic opened up 19-2 lead. Turow slowly rallied with Vlad Moldoveanu hitting from long range, but the visitors never came closer than 7 points. A strong finish to the third and a 9-1 run to start the fourth quarter gave Fenerbahce 74-54 margin as the Turkish champion cruised to victory. Goudelock finished with 21 points and Nemanja Bjelica had a double-double of 14 points plus 10 rebounds to lead the hosts. 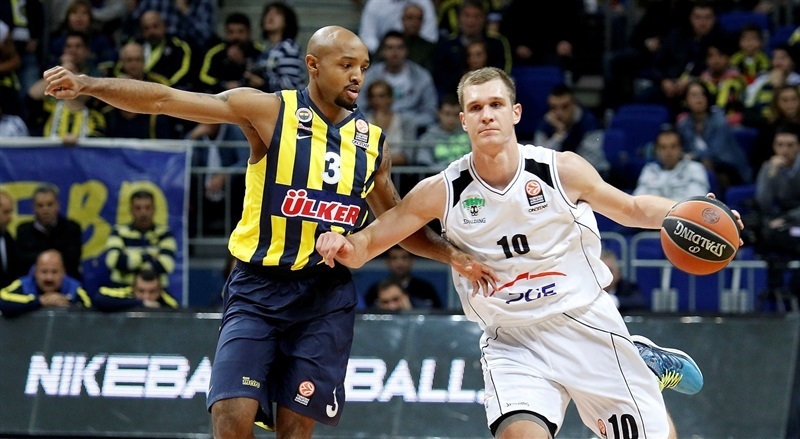 Ricky Hickman scored 11, while Jan Vesely and Luka Zoric added 10 points apiece. For Turow, Moldoveanu nailed 4 of 7 three-pointers for 16 points. 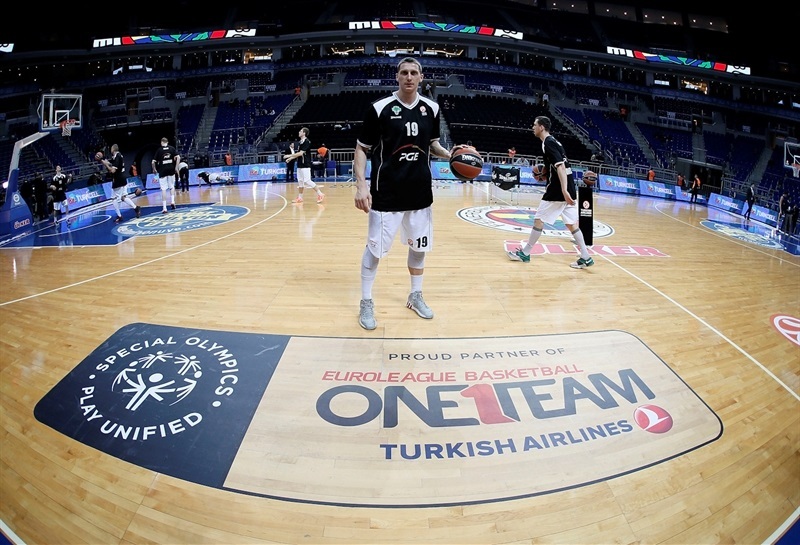 Nemanja Jaramaz scored 15, Chris Wright had 11, and Michal Chylinski added 10. Tony Taylor dished 9 assists, and Damian Kulig pulled down 10 rebounds in defeat. 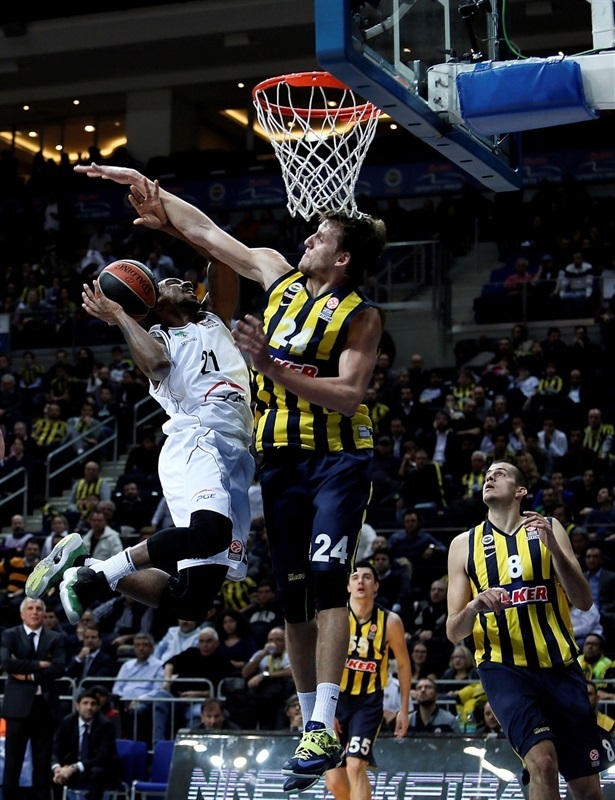 Fenerbahce wasted little time in taking control of the game. 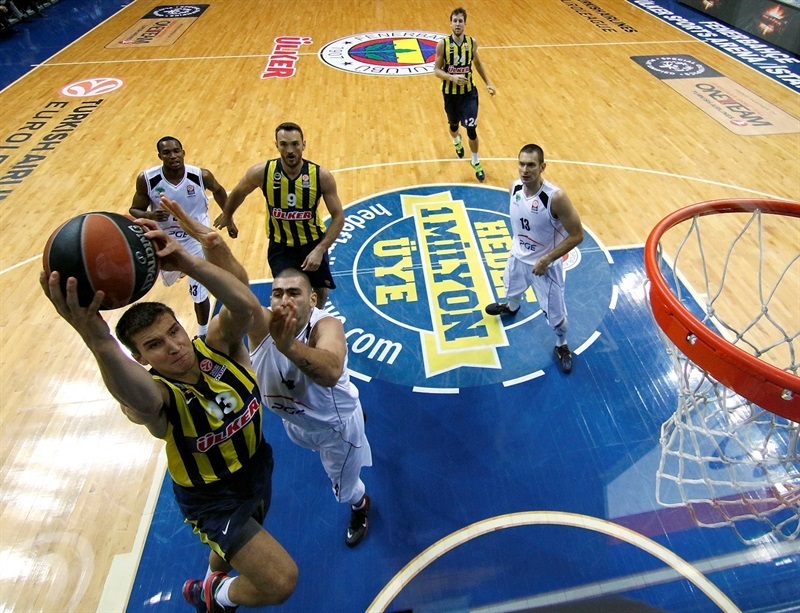 Goudelock hit a jumper, Bogdanovic drove to the hoop for a layup, and Vesely scored from close range to make it 6-0. A triple from Goudelock and a floater from Bogdanovic extended it to 12-0, with less than four minutes gone. Kulig scored a put-back to open Turow’s account, but Goudelock’s answered with his second three-pointer. Then Bogdanovic drove for a one-handed slam. 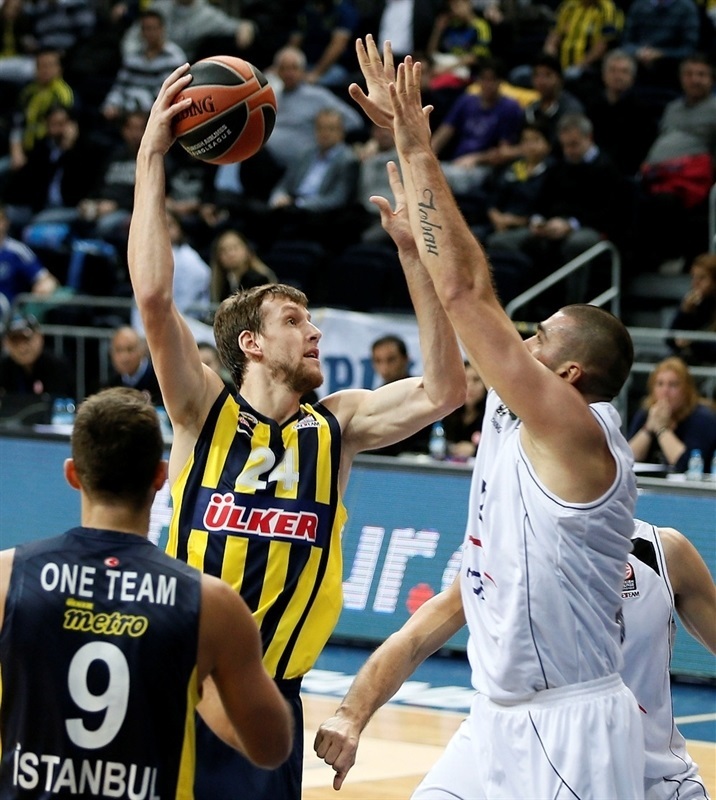 He also got an additional free throw, which he missed, but Vesely was there for a put-back and a 19-2 advantage. Jaramaz drove for a layup for the visitors, and two minutes later Kulig sank a three-pointer to get to 21-7. Turow stepped it up on defense, and for more than fiv minutes of the quarter the hosts only managed to score from the foul line. A three from Moldoveanu cut it to 22-12, but in the final 4 seconds of the quarter, Zoric made a free throw, then Melih Mahmutoglu beat the buzzer from way down town for a 26-12 cushion after 10 minutes. 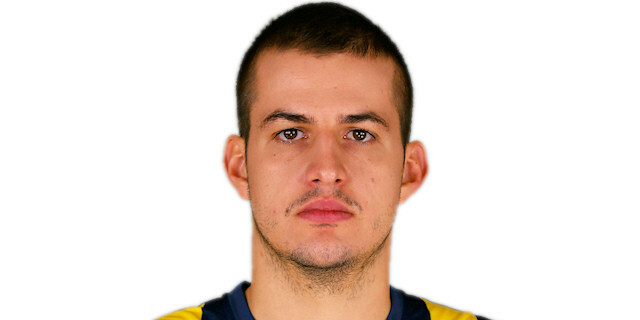 Emir Preldzic opened the scoring in the second quarter. Moldoveanu hit from long range for Turow, before Jaramaz and Zoric traded baskets from close range. Zoric scored another easy layup - his sixth consecutive point - and free throws from Nemanja Bjelica extended it to 36-17. Wright had an alley-oop dunk, before Mahmutoglu and Hickman on one end, traded baskets with Turow’s Ivan Zigeranovic to make it 40-23. Turow continued its good run on offense with Kulig sending a long pass to find Chylinski for a layup, followed by another Wright alley-oop dunk after a pass from Taylor. 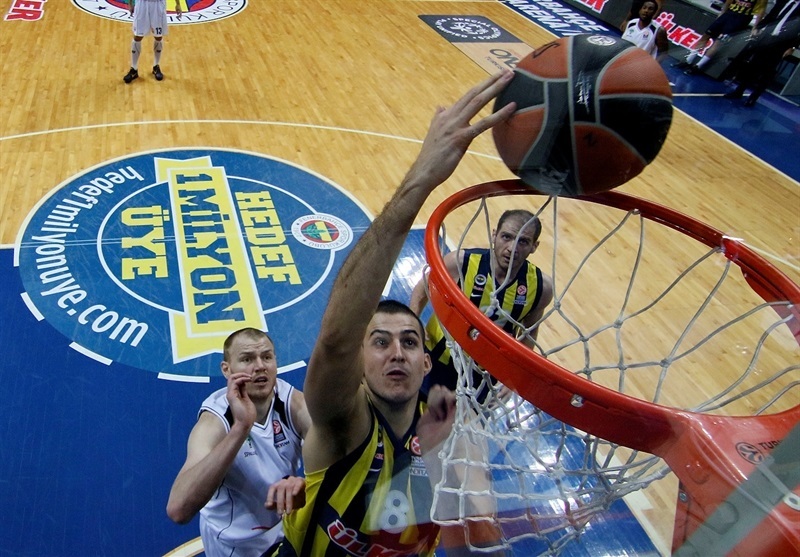 Fenerbahce answered with layups from Bjelica and Goudelock, followed by a dunk from Erden, 46-27. 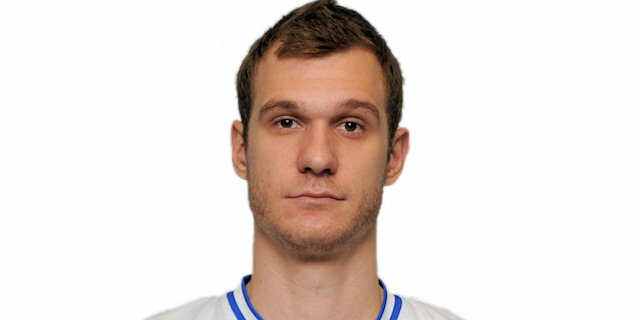 After Chylinsk and Bjelica traded layups, Turow scored the final 7 points of the quarter. Chylinski knocked down a three-pointer, and after another alley-oop from Taylor to Wright, it was Wright who rounded out the scoring with a fastbreak layup, cutting it to 48-36 at halftime. Goudelock started the second half with a three-pointer, but Jaramaz and Molodveanu answered from downtown for the visitors. Erden had a tip-in, and Hickman made a steal and raced for a fastbreak dunk. But Moldovean knocked down another three to help get Turow within 55-48. Vesely scored a put-back, and after free throws from Wright and Moldovenu, Fenerbahce pushed the margin into double figures with Goudelock’s fastbreak bucket and Hickman’s driving layup to lead 61-50. Taylor answered with a triple, but Bjelica scored a baseline jumper, helping make it 65-53. Zoric started the quarter with a huge dunk, before Bjelica and Hickman sank back-to-back triples to extend the lead to 74-54. After a timeout, Jaramaz made a jumper and Uros Nikolic added a put-back to the visitors’ tally. Following a reverse layup from Bogdanovic, Jaramaz and Bjelica traded three-pointers to make it 79-61. Goudelock scored a layup, before Moldoveanu nailed a long two-pointer and Chylinski followed it with a three-pointer. A fastbreak layup from Jaramaz cut it to 82-68. 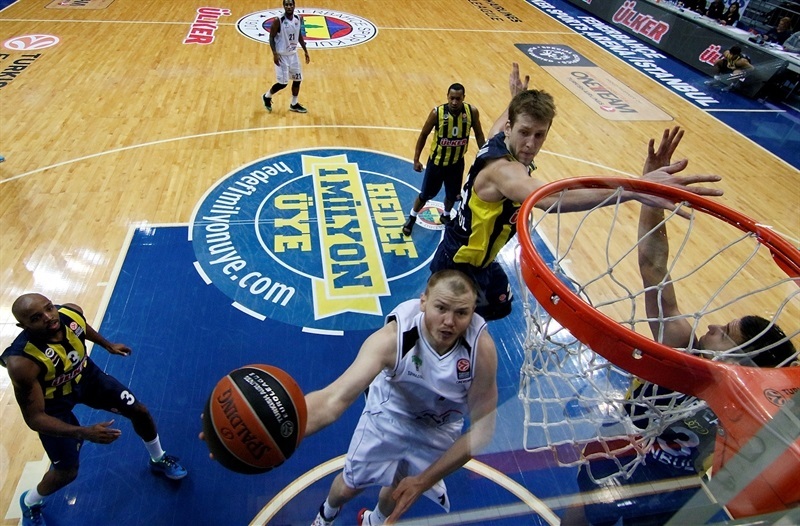 Kulig narrowed the deficit some more, but Vesely mad an alley-oop dunk and a put-back floater for an 86-70 advantage. In the final two minutes of the game, Taylor scored 4 of 5 from the foul line, and Goudelock made a layup-plus-free throw. "Obviously, everything seems perfect when the control of the game was in our hands, especially on offense. Our work on offense was pretty good. When we extended the lead up to 20 points, we started to play one-on-one and made mistakes. Most of the people are underestimating PGE Turow but they are a really good and dangerous teams, with good long-range shooters. They love to play as quick as they can. Anyway, this is an important win for us. Like after every game we played, we have to consider what we did well and what we did wrong on the court. Congratulations to my players but also to the opponent team." 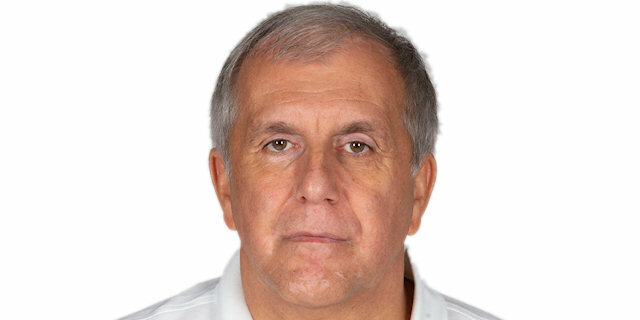 "First of all, congratulations to Fenerbahce Ulker for its win. 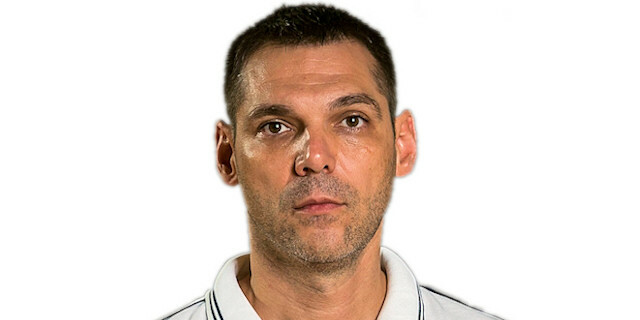 They are one of the best teams in the Euroleague with one of the best coaches of Europe. We challenged them really well except the opening 5-6 minutes of the game. I think my players did what they can do for most of the game. We have to keep on fighting the way we did today." "We started the game really well and all of a sudden, we had a big margin, but it is not easy to defend that kind of big leads until the end of the game. They reduced the gap with big shots behind the three-point line. But our talent allowed us we to control the game." "We struggled too much at the beginning of the game. They pushed us really hard for 5 minutes and outscored us. Then we did everything to come back, reduced the big deficit but it is not easy to return to the game against a strong team like Fenerbahce Ulker. Congratulations to them."